Most affordable ported servo subwoofer. Narrow 16” with front port. Ideal for home theatre. 300WRMS. Most affordable sealed subwoofer. Narrow 14” Ideal for Music/HT. 300WRMS. L12 with white PU paint. 300WRMS. Paper cone multi-tuned ported subwoofer with upgraded driver. Ideal for Music/HT.400WRMS. Entry level paper cone sealed subwoofer. Narrow 14” Ideal for Music/HT.600WRMS. Low inertia dual 8" paper cone sealed subwoofer. Narrow 11” front baffle. Ideal for music/home theatre. 600WRMS. FM8 is similar to F8 but with additional midbass module mode. Compact aluminum cone sealed subwoofer. Great output for its size. Ideal for combined HT/music systems. Recommended for speakers with 5” woofers or larger. 400WRMS. F12SE with white PU paint. 400WRMS amplifier. Less expensive version of F12 with Hypex Ucd-based 300WRMS amplifier. High power version of our standard aluminium cone sealed subs. Features 600w amplifier and a more powerful driver. 600WRMS. Standard aluminum cone vented subwoofer with 2 tuning frequencies: 18hz (two port) and 12.5hz (one port). Ideal for HT systems.400WRMS. Aluminum cone vented subwoofer with 2 tuning frequencies: 18hz (two port) and 12.5hz (one port). Ideal for HT systems. 600WRMS. Dual aluminum drivers tower. Ideal for those seeking highest output from our sealed subwoofers. 800WRMS. Dual opposed 15" driver sealed sub with 1800WRMS amp. Compact size 19" wide and 24" depth. Reduced enclosure rocking with back-to-back drivers. Our range of subs has expanded and we now offer a range of subs for music, home theatre and combined systems. L series is our entry level product line and F/E series is our premium product line. Every one of our subwoofers has bass extension lower than 20hz. Our frequency response specification is based on -3db point which is far more stringent than +/-3db that other manufacturers have used. +/-3db is more like our -6db specification because the former is equivalent to 0db/-6db specification. Lower bass extension is also advantageous in multiple sub setup. At 20 Hz, our subs vary in their maximum output capability. The output at 20 Hz is shown relative to F12. For systems where home theatre is the main priority, we recommend our vented subs. 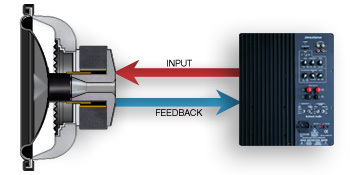 At 20 Hz, a vented sub is comparable to the output of two similar sealed subs. LV12R is our lowest cost sub and is designed for smaller rooms and modest budgets. Our larger 15" subs are suited to larger rooms and have substantially more output. Don't be fooled by typical comments about vented subs lacking accuracy. These subs are tight and musical. For music-only systems we recommend our sealed subs. We have sealed subs in various sizes and finishes. Where high output at 20 Hz is not needed, our sealed subs will match the output of their vented equivalents. In addition, greater extension is possible. Combined with room gain, in-room extension to 14 Hz or even lower is possible. For combined music and home theatre systems, many of our 15" sealed subs are a good all round compromise. Our dual sealed 15" F25 is a very good choice, offering the LFE output of our vented subs but with the added bonus of greater midbass efficiency and output. The secret to accurate bass is in our patented Direct Servo technology. A sensing coil provides immediate feedback to ensure the cone precisely follows the input signal. The result is very tight, accurate and dynamic bass. Our range of Direct Servo subwoofers on this page are available for purchase on-line direct via our website. They are also available through Ascend Ascoustics sold with their speakers.